When the Lifeboat is required at sea members of the public or casualties can contact the MCA (maritime and coastguard agency) via VHF radio or via 999. Once a call come in to them and they decide a Lifeboat is required to launch, they contact the Launching Authority and tell them the nature of the call. The Launching Authority decide which boat(s) to launch and send a message to the crew via pager. Each crew member has a pager with them at all times when it is their week on duty and week on standby. When the coastguard want to request the lifeboat to launch, they contact the Launching Authority when they decide what to do they page the rest of the crew. 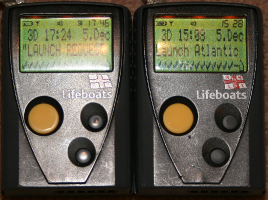 The RNLI have a virtual pager you can download, click here to find out more. When the crew are attending the station to a launch request, they show the signs below on their sun visors and on their dashboard, these signs are issued by the RNLI for the purpose of letting the surrounding people know the crew are on their way to the Lifeboat station. These are only shown when the crew have been called by pager. As you will see one is printed back to front, this allow’s people to read the sign in their rear view mirror. The crew should get to the station within 4-5 minutes of the pager going off. When the crew get to the station they still have no idea what they are being launched to, the boat crew will go straight into the changing room and start getting changed. They should be ready within 90 seconds of reaching the station, once the senior helm is changed they will call the coastguard to receive details. While the boat crew are doing this the shore crew have the task of getting the required boat(s) ready for service. For the Atlantic 85 this includes unplugging and disconnecting the charge cable, packing all the lockers, repacking the sea anchor, closing and secure the anchor locker, fitting the engine covers and taking a hand held VHF radio from the charger and putting on board. On the D-class this includes unplugging and disconnecting the charge cable, taking a hand held VHF and putting on board packing away the equipment into and securing their pouches, close and secure the anchor locker, repacking the sea anchor, screwing the battery breather valve and fitting and securing the engine cover. For night time services a bag has to be packed with 2 search lamps, 2 search lamp battery packs and a night sight, this bag is then secured onto the boat. By the time the crew are changed and have been briefed by the senior helm the boat(s) should be outside ready and waiting for their tasking. When the boats are being launched it is the beach masters responsibility to make sure everything is done safely, the beach master can stop any launch for any reason and is the only one who can tell the tractor drivers to move. Because the beach master can’t be everywhere (especially being able to see the other side of the Atlantic) they will have two helpers, when launching the boats the two helpers will be situated either side of the tractors and DoDo’s. In some cases the helm will want the water tanks turned on (Atlantic 85) so the engines will be warm by the time the boat hits the water, these shore helpers will turn the water on and then walk down to the shore line with the tractors keeping an eye out for walkers and dog’s running around.